One lucky person can win 2 General Admission passes to the North Park Festival of Arts Craft Beer Block (a $60 value), sponsored by Waypoint Public and FM 94.9 and taking place on Saturday, May 17 from noon to 6pm! Entering our raffle is easy! All you have to do is input your email below and confirm your email address. The winner will be selected on the morning of May 15 and will be contacted by email. Each ticket gets you entrance to the consistently sold-out event where you will receive a commemorative taster cup and enjoy thirteen 4oz tasters from a selection of over 30 local craft brewers, several of which are ranked as the best new breweries in San Diego! 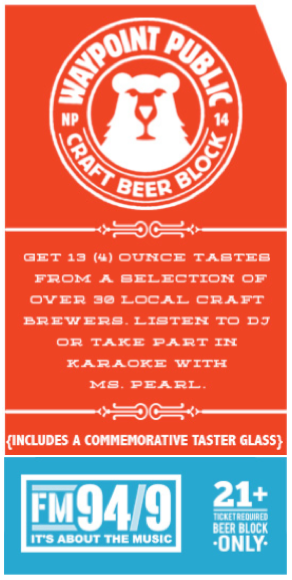 In addition to craft beer the event will offer DJ music from FM 94/9 and if that doesn’t suit your desire you can sing on the karaoke stage with Ms. Pearl. There will be lite snacks for purchase in the Craft Beer Block along with specially designed parklets for relaxing with a beer and your friends. This event was a sell out last year and no day of tickets will be sold. 21 and over ONLY! Visit northparkfestivalofarts.com/craft-beer-block for a full list of participating breweries and be sure to enter the raffle below for your chance to win!